In February 2018 Academous, was voted as 1 of the top 100 most innovative businesses in Greater Manchester in a report published by Business Quarterly magazine and in collaboration with Business Growth Hub. You can find the full report here (we are at page 12-13). I am delighted, excited and honoured. Who said that hard work doesn’t pay? I have recently received an email that I am shortlisted for the Entrepreneur for Good Award for the 2017 Great British Entrepreneur Awards. The awards are powered by Natwest in collaboration with Entrpreneurial Spark aka Espark, the world’s largest free business accelerator. Times Higher Education published in September 2017 the 2018 World University Rankings. We compared the 2017 and 2018 tables and we made this nice infographic. Enjoy!! Original post from our Academous’ blog. Before we talk about us, let’s talk about you. Some of the things below might or might not apply to you but are based on other entrepreneurs’ reflections and opinions. You have a business idea. Very nice! You work full time on your business idea from home but working from home can be very distracting. We compared the 2018 and 2017 World University Rankings published on the 08/06/2017 by Quacquarelli Symonds and we put together a nice Infographic. Enjoy! Original post from our Academous’ blog. For this analysis we used data publicly available by HESA. We are only going to focus on UK Higher Education Institution (HEI) student enrollments in this analysis. 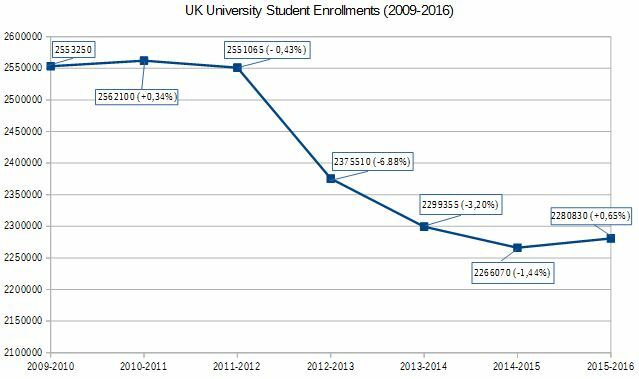 According to the collected data and the following graph, HE Institutions in the UK have in the year 2015-2016 272000 less students enrolled compared to the year 2009-2010.